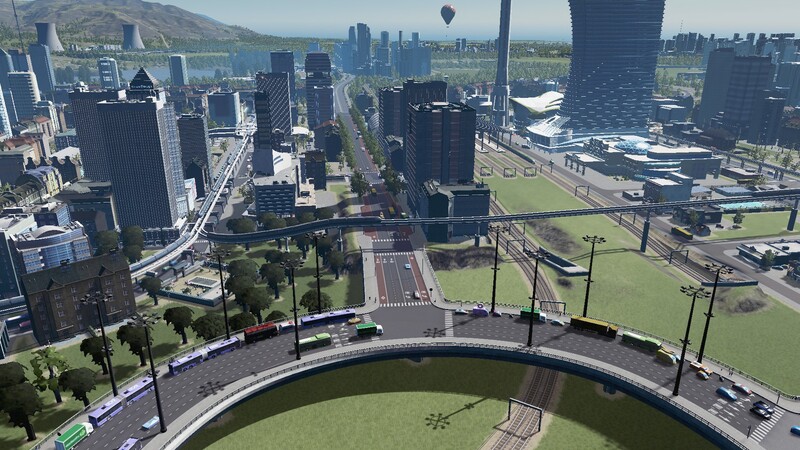 The (occasional) series with Cities Skylines as a communicator tool continues with me looking at Parking Minimums and Urban Highways – #CitiesSkylines Gives a Tragic History Lesson from the USA (ARGH) and today looking at Social Planning. Build, build, build – the name of the game in Cities Skylines until your PC caps out from Memory use. But in doing all that building you are also undertaking social planning at quite a large (although not always visible) scale. Chuck in some realism Mods like Transport Lines Manager (to micro control your transit system), Network Extensions (more road types) and finally Real Time (see below). What is Real Time given it is the closest Mod we have available that influences the social structure of the population? The game time flows slowly. (configurable) You can configure the speed for the daytime and for the night time. The sunrise and the sunset times depend on the map location and on the day of year. (configurable) For example, the days in summer are longer than in winter. The adults may also work second shift and even night shift! And even on Weekends! The firefighters have no days off, right? See the work shifts overview for details. Expect a lot of traffic! Prepare your roads and plan wisely. Don’t underrate the pedestrian paths and pavements! Citizens like to walk and do that often! Citizens need some food for breakfast, so they try to find shops that are closely located to their homes. Make them happy, place some commercial buildings in your residential districts! After work or school, the citizens go shopping or relaxing. They also might find somewhere a freaky bar or a cozy restaurant (a leisure commercial building) and go party! Of course, children stay at home in the late evening. Did you ever see a child dancing on a bar counter? Maybe, the citizens will attend some events like a football match. In addition to the game events, there are some custom events for various unique buildings in your city. Guided tours are an option too. The city residents will join the tourists and have fun! Tourists can stay in your city for longer, and if you have some hotels, they’ll go there for sleepover. In the night-time, no one will visit parks. Only real badass citizens will go out and party at night (in leisure buildings, if there are any). Some citizens will take night shopping tours though. But not the children or the seniors – they sleep at night. Citizens might go shopping even when they don’t need any goods – just for fun! Tourists are not so dumb as usual and also prefer to sleep at night. Citizens remember how long they need to get to work and use this in their schedules – they try to be on-time. To cater for all the above your Urban Geography and social planning skills are going to be put to the test if you want your cities to function well. I am aware Cities Skylines (and Sim City before it) does not allow true mixed use buildings (residential, commercial and office in one building) as of yet. Paradox is also aware of this and hopefully we might see some kind of incarnation of the mixed use building soon. Otherwise yes – try your hand at social planning today and see how well it goes. As Sam points out – it is not as easy as you think! Social Planning has become a main stay in Cities Skylines since the Real Time Mod went live and has been constantly updated. You are no longer just focusing on the physical Geography but now the Human Geography as well. Biffa has started a series with the Mod so I will link that up very soon if you want to see how the mod works.